Inexpensive pinecone centerpiece ideas cost very little as pine cones are free to pick up at local parks and woods, it always helps keep the costs down if your main decoration is free! Where I live the pinecones start dropping from the trees at the end of summer/ beginning of Fall, definitely check when yours will be available. One year I went to make a Christmas pinecone centerpiece and realized I was too late to collect them for free! I had to borrow some from a more organized friend. You could be super organized and collect yours the year before as they do last for ages. 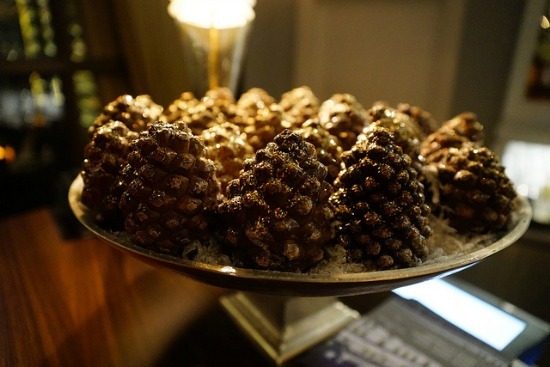 Pinecones are great for Christmas, Winter or Fall wedding table decorations and they look fantastic just by themselves or you could jazz them up a bit by adding some sparkle. To make glittery pinecones all you need to do is add glue to the pinecone and then sprinkle glitter over it, leave it to dry and your pinecones will be ready to use. The easiest way to display them is to have all of your pinecones in a bowl or glass vase, you could add winter berries and evergreen leaves or fairy lights, all sorts of extras to add a splash of color. Apothecary jars are also a more unusual display item, again fill them with cones and your centerpiece is ready. You could even add oranges for a contemporary centerpiece. Pinecone table decorations work really well with candles, a pillar candle in the center and then cones arranged around it. 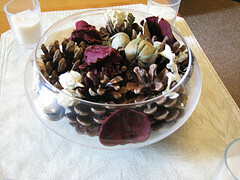 Or for a simple display you could have pinecones arranged along the table with glass votives in-between.